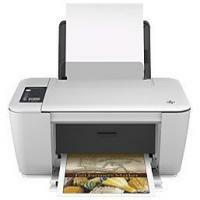 The HP DeskJet 2542 all in one printer delivers easy wireless printing, scanning and copying at an affordable price. Quick setup and preserve space with a compact design. The device enables versatility by printing on different media types such as envelopes, greeting cards, labels, photo paper and plain paper. The printer supports high capacity HP DeskJet 2542 ink cartridges, offering low cost per copy which in turn increases the overall efficiency of the printer. HP DeskJet 2542 printer has innovative and stylish looks with a space-saving design. It can easily fit into any work environment without taking up much space. The device weighs 11.5 lbs measuring 18.2 x 7.6 x 13.9 inches respectively. It connects directly to the PC through USB 2.0 or Wi-fi connectivity option. The printer is compatible with Windows 8 and Mac OS X 10.6. It supports direct printing from smartphones, tablets or notebook for home or small office users. The print speed varies from 20 ppm in monochrome files and 16 ppm in colour files. The device has two trays, input tray is capable of storing 60 sheets of photo blanks and the output tray can store up to 25 sheets of paper. The HP Deskjet 2542 is an affordable all-in-one printer with wireless printing capability. It is a good choice for home users as it is easy to use and setup. Although it supports a wide variety of print media but lacks print quality for photos. printer's limited paper handling capacity does not make it an ideal solution for large business groups as it would be difficult to handle large print jobs. The printer is compatible with all the new versions of the operating system including Windows 8 and Mac OS X 10.6. Is your HP Deskjet 2542 printer delivering blurred or low quality prints? You may get stuck in the middle of an important printing job as your printer starts producing low-quality printouts. This issue may occur because of excess printing which may result in a quick consumption of the ink levels. Try replacing your HP DeskJet 2542 ink cartridges and check the prints again.The troubleshooting of these issues are very simple and can be achieved easily. Excess printing work can also affect the print quality. So if you have been using the printer continuously from a while, give it some rest. Turn the printer off and let it rest for about 30 minutes. If the prints still does not improve, continue with following steps. In other cases, old and dusty papers also affect the print and make it look blurry. If the sheets were stored in the paper tray for a long while, replace them with a new pile. In case of photo blanks don’t leave the papers out for more than 30 minutes. Check the ink levels of all the colour cartridges using the HP software. In case of low ink levels replace these HP DESKJET 2542 ink cartridges and continue with your printing job. Q. Do you offer a set of three compatible hp DeskJet 2542 ink cartridges that includes two black ink cartridges (since I use them more)? A. Yes, a pack of three DeskJet 2542 ink cartridges that has two black ink cartridges is available with us. Q. I reside in a rural area where delivery of products, including your ink cartridges, is a bit slow. If I place an order for hp DeskJet 2542 ink cartridges before 12.00 noon, is the next day delivery guaranteed? A. NO, sorry, we cannot guarantee one-day delivery of your product as delivery of products is a bit time-consuming process though we despatch our products promptly after getting acknowledgment from you. Q. What’s the difference between HP301 and HP301 XL (hp DeskJet 2542 ink cartridges)? Which one is more suitable for people who don’t need to print too often? A. HP301 is a standard capacity ink cartridge while P301 XL is of high capacity, which means it has more ink. If you don’t need to take printouts too often, standard capacity cartridges would be more suitable for you as they are priced lower and get exhausted faster, which is better for your nature of requirement. If you need to print frequently, then HP301 XL will be perfect for you. Q. How should I store opened hp DeskJet 2542 ink cartridges so that they remain functional? A. Please ensure that the cartridges remain sealed in their original package until they are installed. Cartridges tend to dry out when they are out of the printer even for a short duration so if you take them out of the printer for anything, try to fit them back inside again as soon as possible. Q. If I purchase ink cartridges from your site and it turns out to be faulty, how many days are given by you to communicate it to you and get a solution? A. If any ink cartridge that you purchase from us is defective, please let us know about it in 30 days and give us all the details. It will help us to offer you a replacement or a refund once we receive the faulty component and test it. Q. Does getting ink refilled in ink cartridges (I currently have HP DeskJet 2542 ink cartridges) cause any kind of damage to a printer? Is the quality of printouts good when taken from ink refilled cartridges? A. No, getting ink refilled in your ink cartridge will not damage your printer if you take basic precautions. The quality of printouts that taken from refilled ink cartridges are excellent and as good as those taken from original cartridges. Q. I can see copper-coloured contacts on HP DeskJet 2542 ink cartridges whenever I replace them in my printer. Are these the ink nozzles, and is there anything I need to know with respect to them? A. Yes, these copper-coloured parts you see are the ink nozzles of your ink cartridge. You need to ensure that you don’t touch them at all as doing that can result in ink failure, clogs and corrupt electrical connections. Q. I don’t use my printer (HP DeskJet 2542) very often as I travel a lot for work. Should I take test prints regularly if I don’t need to print anything? A. Yes, ideally, you should be running a test print each week if you don’t use your printer regularly. Doing that will help you know if your ink cartridge’s alright, whether you have to clean it and also ensure your cartridges will not dry up. Q. I have been advised to clean my HP DeskJet 2542 ink cartridges as the printouts I’m getting of late are hazy and unclear. Which part of the ink cartridge should I clean and with what material? A. Please take the cartridges out from your printer and turn and examine the part that remains in the printer vertically to see if the copper coloured strip and gold contacts are in good condition. if they are not damaged, wipe them down gently with a piece of plain tissue or non-fibrous cloth. Q. I am unable to print or scan from my HP Deskjet 2542 printer. The printer turns off on it own while I am still about to use it or even when I give the print command. I have experienced the same issue when I use the scanner. What is wrong with the printer? Can I solve it at home? A. Yes, you can easily solve this issue at home. HP designs its printer in a way that it reduces power consumption when the printer is inactive. The Auto Power Off option is the reason your printer might be turning off on its own. If your printer is idle for about 2 hours or so, it turns off automatically. You can change the energy consumption setting from the control panel. You can also disconnect and reconnect the power and USB cable and turn the machine on. The firmware of the printer should be updated. If you still experience the same problem then try plugging the printer into a different electrical outlet and make sure that it is plugged directly. If the electrical disturbance is caused by any other devices that you are using then shift them to other electricity points. Q. My printer is displaying Alignment Failed error message on the screen. Does this have anything to do with the new hp DeskJet 2542 ink cartridges? How do I print now? A. You can begin by resetting the printer. When the printer is on and silent, disconnect the power and USB cords. Disconnect the power cord from the electrical outlet. Wait for about a minute and reconnect the cords. Turn the printer on. If the message reappears then take a printout of the alignment page and evaluate it. This page will show if any ink cartridge requires replacement. If that is the case then replace with new hp DeskJet 2542 ink cartridges. You should also clean the printhead of the printer and cartridge contacts and make sure that the hp DeskJet 2542 ink cartridges that you have installed have been installed correctly. Doing so will solve the error and you will be able to print. Q. My HP Deskjet 2542 printer displays “Ink Cartridge Missing” message. I have just replaced the old ink cartridges with new ones. What do I do to solve this? A. Such error message are displayed only if the installation of the new hp DeskJet 2542 ink cartridges has not been done properly. To check it, you need to turn the printer on and open the lid. Release the ink cartridge from the cartridge carrier and inspect it. You have to see if you have removed the protective tape that covers the nozzles of the hp DeskJet 2542 ink cartridge. Clean the cartridge contact using distilled water and a cotton swab if required. You should be extremely careful while doing so as any damage caused to these parts may permanently damage the cartridge. Give attention while installing the ink cartridge back into the slot. Insert it to the slot respective to the color. If you mix up the color then the printer will have error while printing. Make sure that the ink cartridge that you have placed into the slot is locked in place. Repeat these steps with the other hp DeskJet 2542 ink cartridges. Do not take all the ink cartridge out at once as leaving the ink cartridges unattended will cause the ink to clog and block the nozzles. Once you have installed all the ink cartridges, disconnect the power cord and the USB cable and unplug the printer cord from the power source. Wait for about 30 seconds and plug the power cord and connect the other cables to the printer.